The US will help its allies in the Middle East meet their security needs and counter the growing power of Iran, the US secretary of state has said. Condoleezza Rice flew to the region a day after announcing arms deals worth $63bn (£31bn) for Middle East allies. She visited Sharm el-Sheikh, Egypt, with US Defence Secretary Robert Gates, as they seek to convince allies to help stabilise Iraq and counter Iran. But Syria and the Palestinian Hamas faction criticised US regional policy. Ms Rice and Mr Gates met Egyptian President Hosni Mubarak and Arab ministers at the start of a tour also aimed at uniting US allies against Iran, Syria and Hezbollah. They are also trying to win support for a Mid-East peace conference planned for later this year, correspondents say. Syria's foreign minister said the arms deals were "dangerous", while Mahmoud Zahhar, a senior Hamas figure, said US peace conference plans were a waste of time. Both Ms Rice and Mr Gates will visit Saudi Arabia - which is expected to receive a share of $20bn (£10bn) in military aid - before the secretary of state continues onto Israel and the West Bank. 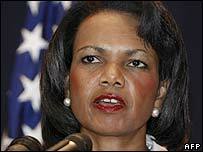 Before arriving in Sharm el-Sheikh, Ms Rice described Iran as "the single most important, single-country challenge" to US interests in the Middle East. In Egypt, she said the US was making sure its allies in the region were well protected, after Iran accused the US of trying to spread fear and mistrust. Iranian foreign ministry spokesman Mohammad Ali Hosseini has accused the US of tarnishing good relations between countries in the region. "The United States is determined to assure our allies that we are going to be reliable in helping them to meet their security needs," Ms Rice said. She met Arab League Secretary General Amr Moussa, saying their discussions focused on Iraq, Lebanon, and the prospects for a two-state solution for Israel and the Palestinians. And she insisted that Iraq's neighbours understood the need to bolster the government in Baghdad. The BBC's Heba Saleh, in Sharm el-Sheikh, says the Arab countries at the meeting share America's displeasure at Iran's rising influence in Iraq and in the region. If there was any note of discord at Tuesday's talks, that was kept behind the scenes, she adds. Iran's nuclear programme and influence among Shia Muslim militant groups have long been sources of US concern. The regional visits come after Washington confirmed plans for massive arms deals for the region. The main beneficiaries of the deals are Israel, Egypt and Saudi Arabia. The Jewish state said the package would allow it to maintain its military "qualitative edge" in the region. The sale of satellite-guided bombs to Saudi Arabia, the first such sale to any Arab country, is thought to be part of the proposed $20bn arms deal with the kingdom and five other Gulf states - the United Arab Emirates (UAE), Kuwait, Qatar, Bahrain and Oman. While in the region, Ms Rice and Mr Gates are expected to ask Saudi King Abdullah to do more to support the Iraqi government of Iraqi Prime Minister Nouri Maliki. The US ambassador to the UN, Zalmay Khalilzad, has gone as far as accusing Saudi Arabia of undermining efforts to stabilise Iraq. The weapons deals need to be approved by Congress, and appear set to encounter Democratic opposition in Congress.